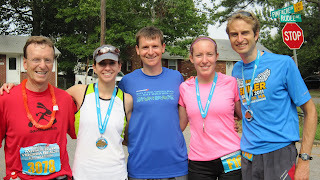 Until almost race day I wasn't too excited about the Virginia Beach Rock & Rock Half Marathon. It took place over Labor Day weekend in Southern Virginia (hot weather!) and getting to it (I-95 S from DC) was the usual mess. However, I chippered up once I was with everyone else running. They are all veterans of the event, and Justin's dad is a "streaker"-he has been formally recognized by the race for competing in all 11 of the VA Rock & Roll Halves to date. My fellow runners were excited about the race and the bands at every mile and they were anticipating relatively cool weather. Of note is that Kaitlin had an elite number-F16. Yes, like the plane. It was awesome. Before the race Kaitlin warmed up next to Ryan Hall with the rest of the elites. Justin and I were watching and chatting with Kaitlin. Chad (who high-fived Ryan) lined up right behind the elites at the front of the first coral and Justin and I lined up a few rows behind Chad. And we were off! Justin took off ahead of me and I was left to my own devices. Recently the half marathon has not been my friend. In 2010 I ran the NJ 1/2 the first week in May after training in Boston all winter. There were record highs and I ran/walked it in w/ a 2:12 and a touch of heat stroke. In February 2011 I ran the New Bedford 1/2 where I was exhausted from Boston Marathon training and I had a cold that caused my heart rate to raise by 1,000,000 bpm just from picking up my sneakers. During that race I walked whenever my ankle hurt and also ran parts of the course backwards to pick up clothing that I kept accidentally dropping. I ended up w/ the 1:42:13 that is my current PR. I had an idea of what I thought I might try and run at VA Beach (7:25 min/miles) but I ran based on feel and I was running around 7:10 min/miles for a while. As a perennial "go-out-too-fast runner" I consider that excellent control for me! It was warm, but overcast, and the situation was manageable. I tried to stay hydrated. Around mile 6 I started to get a bit alarmed. I was tired. My pace was slipping to 7:25 min/miles. I had a stomach cramp that HURT. Around this time I got the idea to try and hold on for a finish under 1:37 which is the time that will automatically qualify a woman under 40 for the NYC marathon if she is so inclined. (I am not so inclined, but the mark exists so it served as a good goal). I continued on and remained calm. I was concerned that I was running more slowly than earlier and a couple of people were passing me, but I never felt awful. I was running hard enough that the desire to stop running was definitely there (the sign of a good race!) but I kept on truckin. Around mile 8 I perked up and by mile 9 I was dropping 7:10s again. I was passing people (I was especially on the lookout for women to pass) and I wondered where my relative endurance was coming from since I don't run a huge amount of miles (just under 40 mpw with a long run that maxed out at 14 miles in preparation for this race). The final mile I dropped to 6:30/40 pace and pushed it in. You can see the finish line about a kilometer before the end and it is brutal to be able to see the finish and have so much race left! I managed to pass two more women between 20K and 21K and I crossed the line in 1:35:23. I scored an almost 7 minute PR, I achieved my pre-race goal of finishing top 25 in my 30-34 AG (I was 11/1097), and I successfully kept my fear of the heat under control. I've been feeling fit and training hard and it was pretty darn cool to see it all come together.